A winter storm is expected tonight into Tuesday evening. A period of heavy snow and gusty winds are expected tonight, particularly between midnight and 9:00 Tuesday morning. The most likely area for heavy snow is from south central to central Wisconsin along with east central Wisconsin where some lake enhancement may occur. Expecting about 6 to 9 inches in the warning area with gusty winds to 30mph overnight before diminishing for a period during the day Tuesday with another increase in winds out of the northwest toward late afternoon Tuesday. 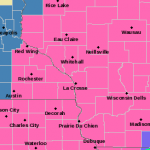 In southeast Wisconsin, 3 to 6 inches is expected along with the gusty winds for the period overnight.